In a bid to widen the scope of services, Indian IT majors have been beefing up their research and development efforts. During the financial year 2010, Infosys Technologies increased its R&D spend by almost 65% to Rs 440 crore as compared to Rs 267 crore in the financial year 2009. The increase in investment in the FY10 was by Rs 173 crore as against an increase of Rs 66 crore in FY09. Technology firms have been increasingly looking at alternative options to cater to clients and do away with the linear business model. 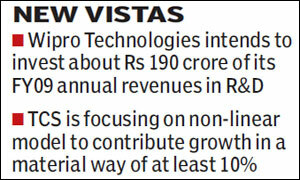 In December 2009, Wipro Technologies said it intends to invest about Rs 190 crore, or 1%, of its FY09 annual revenues (about Rs 19,170 crore) in the current financial year in R&D of new technologies. Recently, Tata Consultancy Services CEO & MD N Chandrasekaran said the firm was focusing on the non-linear or next generation model to contribute growth in a material way, of at least 10%. In a statement in the company's annual report, Infosys CEO & MD S Gopalakrishnan said, Our R&D efforts have helped us win large deals across industry verticals in FY10 and offer new services to clients in the areas of digital convergence, information management, cloud computing, high performance and grid computing and software engineering. Without disclosing any future investment figures the firm said it would continue to invest into research in these areas. We will continue to focus on and collaborate with leading national and international universities, product vendors and technology start-up companies. We want to create an ecosystem to co-create business solutions on client-specific business themes, Gopalakrishnan added. However, analysts view that Indian technology firms still lag behind in terms of investment into new technologies and products as compared to international technology players like IBM, HP, Cognizant and others. Viral Thakker, partner, sourcing advisory services practice, KPMG said, Indian technology firms lack in a wide range of product portfolio and we expect them to invest much more in areas that could transform into revenue streams going ahead. Infosys said it was working on seven key areas that are rapidly increasing in influence, and present great scope for IT-led innovations digital consumers, emerging economies, sustainable tomorrow, smarter organisations, new commerce, pervasive computing, and healthcare economy.